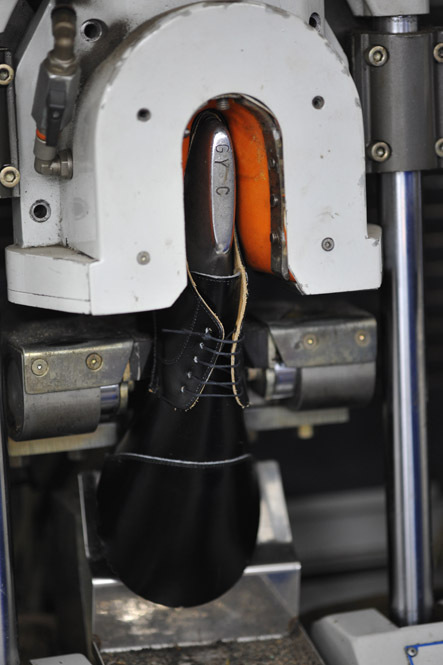 Charlet pays great attention to the making of each of its PATINO shoe. A worthy successor of the age-old Italian ‘savoir-faire’ Charlet is committed to offering shoes which combine impeccable quality with a design and finish of rare esthetic qualities. Patino reinvents the classic shoe adapted to the modern life of lovers of beautiful shoes. Each pair is hand made by shoe craftsmen and checked by expert shoemakers every step of the way. All the PATINO shoes are ‘Goodyear stitched’- the Rolls Royce of shoe stitching. In luxury shoe shops the leather used to create the shoes is a determining element for the quality and longevity of said shoes and no compromises are allowed. For this reason, like the great French, Italian and English leather craftsmen, Charlet selects its full grain calfskin leather among the best leather skins from the celebrated Annonay tannery in France. The shoes from The Iconic Collection are entirely hand patinaed exclusively with natural pigments and quality essential oils for an inimitable result. Each shoe is therefore unique. To create a Patino, no less than 200 skilled, meticulous steps are necessary. Before the actual construction of the shoe, a designer submits sketches from which the patterns are drawn. The first patterns are applied to a wooden form to make the first sample. When all the alterations have been made the production can begin. The first step in the production process is cutting the upper part of the shoe. This step is always performed manually, cutting in the direction of the skin and is performed by a cutter, with the aid of either a leather knife or a punch. Following this, a leather lining is added to the interior part. This cutting requires great precision and a lot of experience since each piece must be cut perfectly to the millimeter. A good cutter must have an excellent knowledge of the nature of leather in order to take full advantage of the piece while conserving the exceptional quality of the leather. At this time, depending on the design of the shoe, an operation of perforation to certain parts of the leather may take place. Next comes the pricking step and the assembling of the different precut leather pieces to start forming the master mold for the shoe. The finished upper is placed, stretched and clamped onto a wooden form to adapt perfectly to its shape. Then the interior part is nailed on so the leather molds to the form perfectly. To process the leather ware for the next steps the shoe is then enveloped in a plastic film creating a second skin for the shoe in progress. The craftsman sews the welt (a leather strip) on the wall of the first mold. This is the key element in the process known as ‘Goodyear sewn’. The top of the first molding is wrapped in cork and wooden arches are inserted to give it support. Then it is filled in with natural cork. This is a fundamental step to give flexibility and comfort. The natural cork allows for good breathability and little by little takes on the shape of the foot (just like a footprint in the sand), giving the shoe a made-to-measure aspect. This is the preparation of the bottom part of the shoe. The first section and the leather sole are cut into leather strips using heavy presses. Each sole is cut perfectly according to the size of the shoe. The stitching of the sole is one of the most important steps. All the PATINO shoes are ‘GOODYEAR stitched’. To obtain a total resistance to time, the ‘Goodyear stitched’ procedure allows the body of the shoe to become more resistant and last much longer. 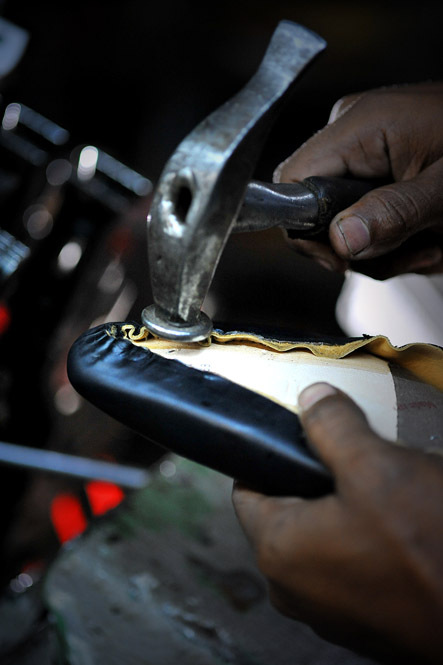 This technique, characteristic of high quality luxury shoes, fulfills the desires of a most demanding clientele; high quality material, perfectly stitched with minute precision, offering lasting durability, great comfort and an ease of resoling which extends the life of the shoe. A ‘Goodyear stitched’ shoe does not lose its shape, ensures excellent foot support and maximum protection in bad weather. This type of shoe is conceived to last for many years to come. Thus when the sole is worn, it is easy to replace and to stitch on a new sole without endangering the rest of the construction. The resoling is done without any alteration of the upper. The heels are tinted and fitted. 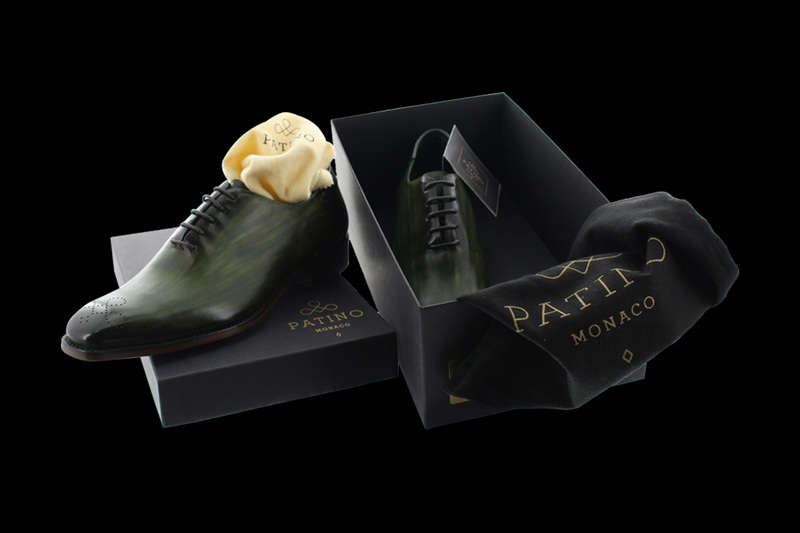 A leather plate is stamped ‘PATINO Monaco’ and nailed onto the green sole. Then the craftsman applies polish to the sole and the heel to insure waterproofing and shine. Next comes the last step: Quality control. Before being placed in the box, the two shoes are inspected one last time by a quality expert.